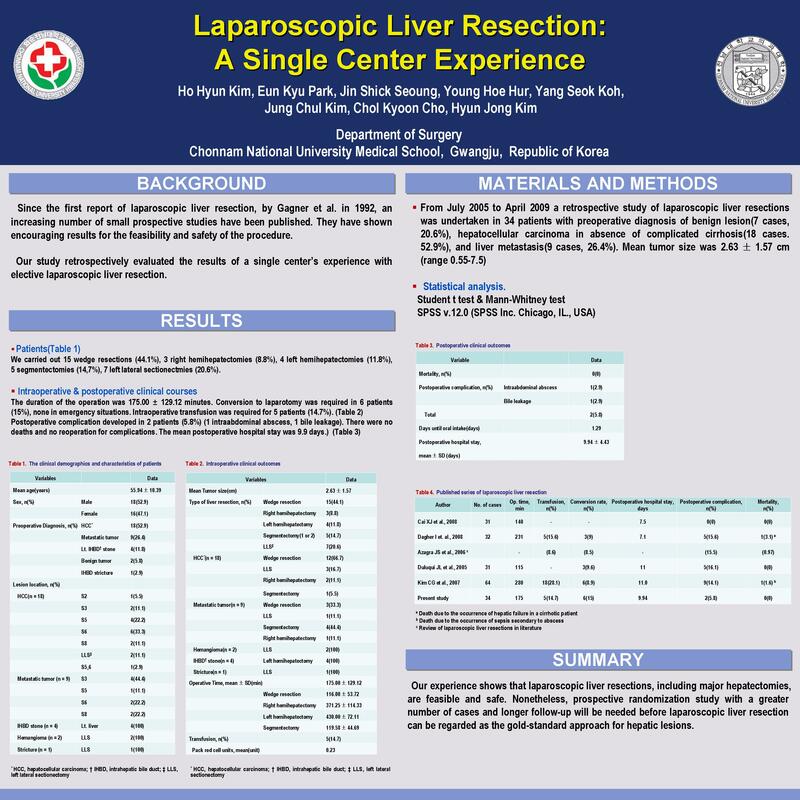 (Background): Since the first report of laparoscopic liver resection, by Gagner et al. in 1992, an increasing number of small prospective studies have been published. They have shown encouraging results for the feasibility and safety of the procedure. This paper retrospectively evaluated the results of a single center’s experience with elective laparoscopic liver resections. (Results): We carried out 15 wedge resections (44.1%), 3 right hemihepatectomies (8.8%), 4 left hemihepatectomies (11.8%), 5 segmentectomies (14.7%), 7 left lateral sectionectomies (20.6%). The duration of the operation was 175.00 ± 129.12 minutes. Conversion to laparotomy was required in 6 patients (15%), none in emergency situations. Intraoperative transfusion was required for 5 patients (14.7%). Postoperative complication developed in 2 patients (5.8%) (1 intraabdominal abscess, 1 bile leakage). There were no deaths and no reoperations for complications. The mean postoperative hospital stay was 9.9 days. (Conclusion): Our experience shows that laparoscopic liver resections, including major hepatectomies, are feasible and safe. Nonetheless, prospective randomization study with a greater number of cases and longer follow-up will be needed before laparoscopic liver resection can be regarded as the gold-standard approach for hepatic lesions.